Straffan and Two Mile House lead the way in this week’s Kildare Nationalist junior football championship team of the week. The front runners for this year’s junior title each have four players in the team after the final round of group games. 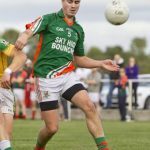 County minor captain Mark Sherry and Kildare senior panellist Rob Kelly are among those who made the cut. Next best are Castlemitchell with three players while Milltown have two and Rathcoffey and Rheban have one each. The team in full: John Goff (Two Mile House); Brian Byrne (Two Mile House), Niall Gaynor (Straffan), Mark Fennelly (Castlemitchell); Paul Moran (Straffan), John O’Reilly (Milltown), Jamie Brilly (Rathcoffey); John Fennelly (Castlemitchell), Michael Colleton (Milltown); John Owens (Rheban), Mark Sherry (Two Mile House), Trevor Griffin (Castlemitchell); Austin Allen (Straffan), Rob Kelly (Straffan), Aiden Casey (Two Mile House).